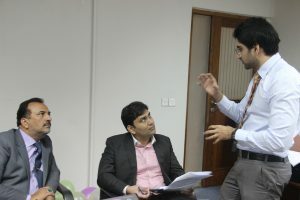 Nadeem Khan, a current student on the MA Human Resources and Consulting, has already started putting the theory from the programme into practice, working with a bank in Pakistan. Here, he talks about how he applied what he has learnt so far on the programme. Nadeem (far right) delivering the session for SBP in Pakistan. As an HRD Consultant I had worked for several years prior to starting the programme. Before leaving Pakistan I had informed clients of my schedule during the programme and that I would be open for assignments during my winter break. The National Institute of Banking and Finance (NIBF), a subsidiary of The State Bank of Pakistan (SBP) wanted me to deliver a two-day learning intervention in December 2016 on ‘Building Dynamic Teams’. I believe this proved to be a great opportunity for me to put the theoretical frameworks and skills that I had learned from the programme into practice. The design and dynamics module had prepared me early on to outline the structure and activities that were to be incorporated in the two-day learning intervention. I picked up lots of ideas and activities drawing from the coursework. As there were 18 individual contributors from teams from all branches of SBP, I also had to keep in mind learning from difference. The careers module played a significant role when it came to selecting the relevant content for the SBP intervention through its focus on communication and effective team dynamics. The MA HRC is set in a way that I had the opportunity to both study and experience firsthand group structures and processes, feel the power dynamics and struggles in teams, live the communication patterns and decision making and experience team leadership on the programme. Therefore, when I was delivering the workshop I was able to share my experience of being in similar shoes to the participants, making my examples more credible and worthwhile. Overall, the improved design, theoretical framework and quality content enabled me to score higher feedback than previous interventions I had facilitated at SBP. NextEnd of Lent Term and Hey! It’s My First Spring!